Aldol reactions are useful in organic chemistry synthesis for creating new carbon to carbon bonds. This reaction can occur as an aldol addition reaction at lower temperatures forming a beta-hydroxy aldehyde or ketone, or as an aldol condensation reaction at higher temperatures forming an alpha-beta unsaturated product. 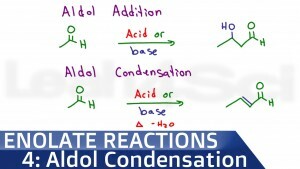 This video walks you through the addition and condensation reaction mechanism in acidic and basic conditions.